Crossfit Zoh is the only gym in the city that offers the drumming based Pound Workout to help you drum (or Dandiya) your way to fitness. We’ve seen Zumba, Crossfit, and Spinning take stage as a fun group-based workout over the years, and there’s a (relatively) new kid on the block and it’ll really Pound you into shape! Combining the thrill from drumming, the energy from any cardio dance workout and movements inspired by conditioning exercises like Yoga and Pilates, the Pound workout will have you shaping up while rocking out. Crossfit Zoh (previously known as Zoh Fitness) in HSR is the only official center that offers Pound workouts twice a week. 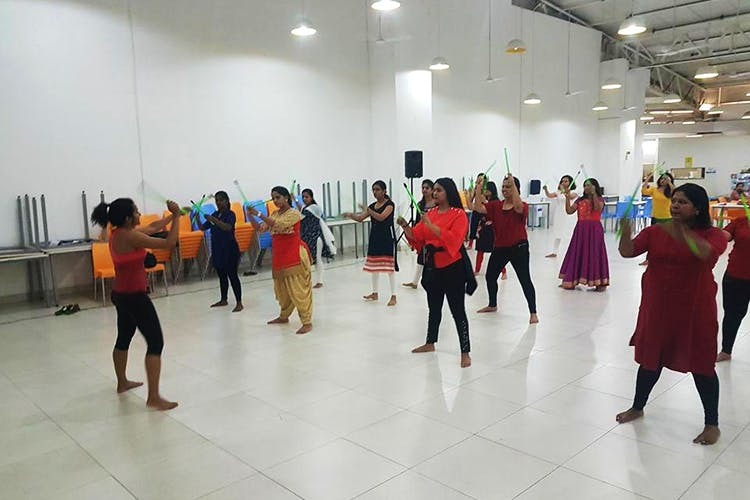 Bright green drum sticks (called ripstix, developed by the brand Pound), loud music with a diverse set of beats, and a whole lot of energy are all you need to start pounding away at those body image issues, because it’ll be just like playing Dandiya without a partner if you think about it. The gym offers other group based workouts like crossfit, martial arts, and strength and conditioning if you’re looking for something more conventional and less dancey. Keeping things different and intense is something they take seriously as they also offer holistic training for marathon runners right from mind training to nutrition advice. For lovers of the outdoors, they organise intense treks (yes, you’ll have to workout in the great outdoors as well) and fitness camps, but this option is only for those of you who already have a membership at the gym. The entire family can train here as they have training programs for children, senior citizens and can customise your workout to suit your needs.